Helps in avoiding Outlook PST file corruption due to being over-sized by removing duplicate emails..
An immensely helpful duplicate remover methodology to find out all the duplicate mail items and performs the customized action on infected mailbox or PST folder. The utility significantly reduces the size of the Outlook PST file and thereby decreases the chances of corruption. 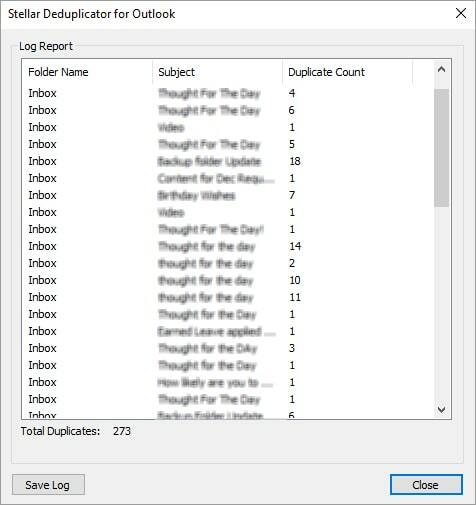 The software efficiently locates all the duplicate copies of emails from your Outlook mail folders (Inbox, Outbox, Sent Items, Deleted Items folder etc.) and performs the specified action on them. After installation, Stellar Outlook Duplicate Remover appears as an Add-In icon on the Outlook tool bar. This feature of the software provides an ease of usage by giving the opportunity to run the software from within your MS Outlook application. Removes duplicate mails from multiple mailboxes simultaneously. 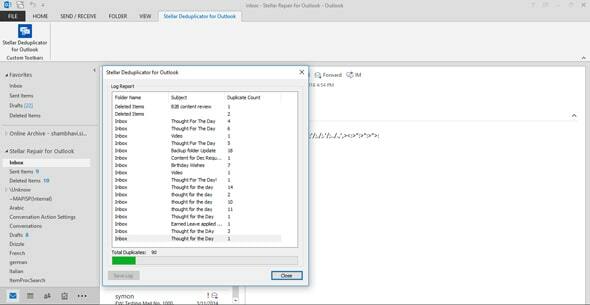 The software allows you to select any number of mailboxes from your MS Outlook application and remove all the existing duplicate emails. Scans the mailboxes and lists all the duplicate emails, falling within the specified time span. The software finds out duplicate mails based on various time-range, including 'Last Day', 'Last 2 days', 'Last 5 days', 'Last 10 days', 'Last 20 days', 'Last 30 days', 'Last 50 days', Last 75 days', 'Last 100 days', 'Last year', 'Anytime' etc. The software provides a wide range of scan criteria, with which you can scan the selected mailboxes and identify the required duplicate emails. The range of scan criteria, provided by the software include - 'Text', 'Subject', 'Sender Email', 'Sender Name', 'Recipient Name', 'Internet Header', 'Attachment Files', 'Date and Time of Sending'. 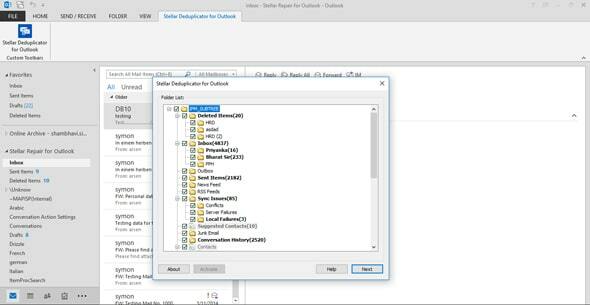 The software provides options to specify an action on the duplicate emails found from the selected Outlook mailboxes. 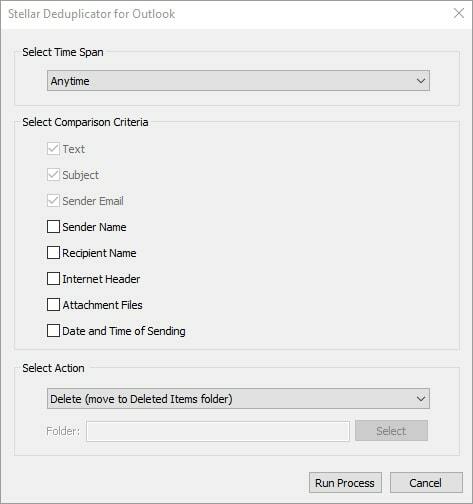 The list of personalized actions, which you can perform on the duplicate emails include - 'Mark as Expired', 'Delete (move to Deleted Items folder)', 'Copy to folder', 'Delete permanently', 'Move to folder' and 'Mark with the flag'. Generates detailed Log Report of the entire process, which can be used for any future reference. The Log Report stores various information regarding the Name of the mail folder, Number of duplicate mails found from the folder, and Total number of duplicate mails found etc. 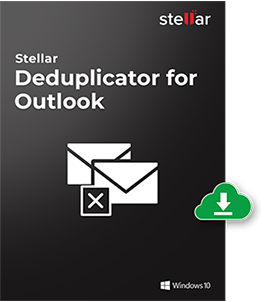 With simple and highly interactive graphical user interfaces, Stellar Outlook Duplicate Remover provides a user-friendly platform to remove unwanted duplicate Outlook mails, without any further assistance. My Outlook mailbox was a complete mess of duplicates and conflicting emails. It had affected the synchronization with clients as well as huge time waster. There has never been a better time before using this duplicate remove software. Definitely a gift for garbage free outlook environment. Que: How Outlook Duplicate Remover helps in reducing the PST file size? The Outlook PST file stores all your mail items in the Outlook mailboxes and with every new mail, the size of the PST file grows. Sometimes, during migration of servers or due to network problems, your mailboxes gather duplicate copies of mails. 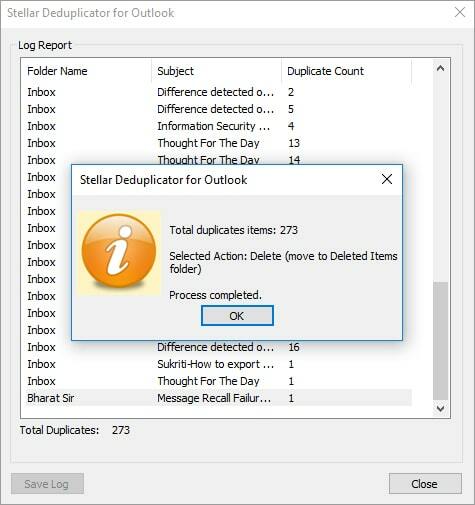 If your mailboxes have gathered significantly more number of duplicate mails, then Stellar Outlook Duplicate Remover helps in removing the duplicate emails and thereby reduces the overall size of your Outlook PST file.